Haking, Halina Paulette. Photograph gallery. Photographically, you got what you paid for with the Halina Paulette. When everything is in it's favour it will turn in a favourable result, but light bouncing around the inside of the camera ruined a third of a roll, it's best to shoot down sun. The noise the shutter makes on release does nothing to disguise the cheapness of the internals either. 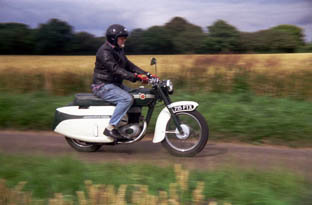 Here it behaved, with a panning shot at 1/50th sec of this 1959 two stroke Francis Barnett Cruiser. I get to ride this bike from time time and have to say that motorcycles, like cameras, have developed somewhat since then. Left, is an old Douglas Dakota DC3 airliner, I took this because I liked the cloud and spent 15 minutes cowering under the same aircraft whilst this cloud's big sister unloaded. At right (blimey, it's in focus!) 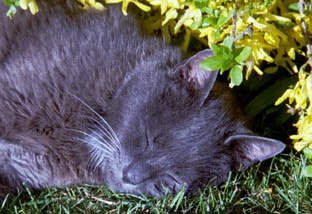 we have Raffy, our late geriatric, diabetic moggy doing what he generally did for 17 hours a day. I took this because most family cameras would be expected to undertake these duties, this is a small portion of the negative. So in the final analysis, the Paulette achieves what it set out to - take everyday pictures cheaply.